Climate change; Holocene; pollen proxy; Assam. 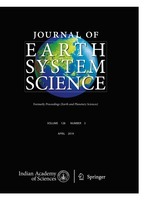 Pollen analysis of a 3.2-m deep sedimentary profile cored from the Dabaka Swamp, Nagaon District, Lower Brahmaputra flood plain, Assam has revealed persistent fluvial activity during 14,120–12,700 cal years BP which may be attributed to the paucity of pollen and spores with encounterance of fluvial marker taxa like Ludwigia octavalvis and Botryococcus. Later, fluvial activity was succeeded by the tropical tree savanna under cool and dry climate between 12,700 and 11,600 cal years BP corresponding to that of global Younger Dryas. Between 11,600 and 8310 cal years BP, relatively less cool and dry climate prevailed with inception of tropical mixed deciduous taxa like Shorea robusta and Lagerstroemia parviflora. This phase is further followed by a fluvial activity between 8310 and 7100 cal years BP as evidenced by trace values of pollen and spores. Fluvial activity was further succeeded by enrichment of tropical mixed deciduous forest under warm and humid climatic regime between 7100 and 1550 cal years BP which is well-matched with the peak period of the Holocene climatic optimum. However, during 1550–768 cal years BP, final settlement of tropical mixed deciduous forest occurred under increased warm and humid climate followed by deterioration in tropical mixed deciduous forest under warm and relatively dry climatic regime since 768 cal years BP onwards due to acceleration in human settlement as evidenced by Cerealia. Increase in Melastoma, Ziziphus and Areca catechu imply forest clearance at this phase. The occurrence of degraded pollen-spore along with adequate fungal elements especially, Xylaria, Nigrospora and Microthyriaceous fruiting body is suggestive of aerobic microbial digenesis of rich organic debris during sedimentation. Birbal Sahni Institute of Palaeobotany, 53 University Road, Lucknow 226 007, India.